This charm bracelet is a wonderful object lesson and a reminder. It was designed to go along with a talk on the Holy Ghost that you can use at LDS baptisms. See the full Gift of the Holy Ghost talk. Each charm represents a different aspect of how the Holy Ghost blesses us. I wanted little girls to be able to wear these while playing and not worry about losing charms, so I use split rings to attach them. It takes more time, but it makes it almost impossible for the charms to accidentally fall off. All charms have been made in the USA and are lead free. 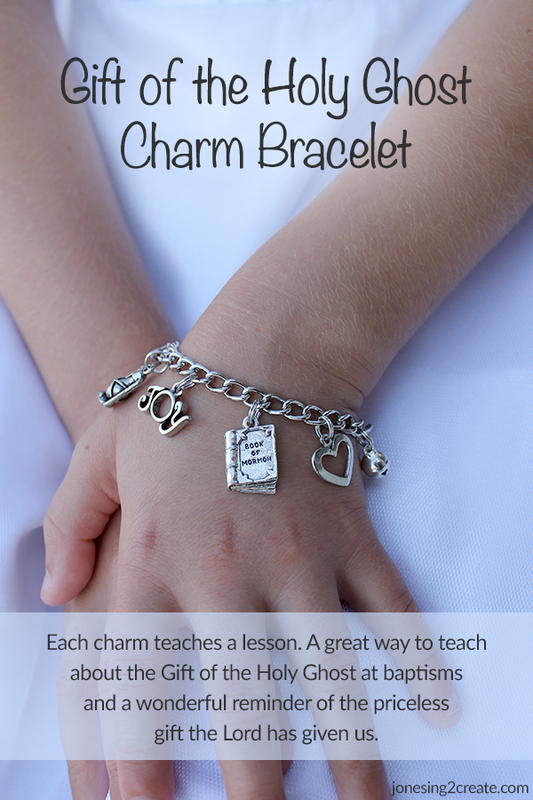 Included with your bracelet is a professionally printed card explaining the meaning of the different charms. The 7.25 inch chain fits most little girls and petite adults. You can also purchase this bracelet on Etsy. 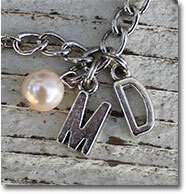 Give your bracelet a personal touch by adding initials or a birthstone. If you are ordering more than one bracelet, be sure to explain which extras belong with which bracelet. Visit my customization page to see a full list of my dangles, how they are added, and instructions on how to make special requests. If you will be mailing your bracelet directly to somebody else, I can gift wrap it for you for only $4!